Make real wood-fired pizza with a delicious crispy base in your own home. The 100% thermal shock proof NillTherm™ ceramic oven has all the cooking characteristics of a conventional pizza oven, with a warm-up time of only 30 min and can maintain 350°C for hours with only one fire. 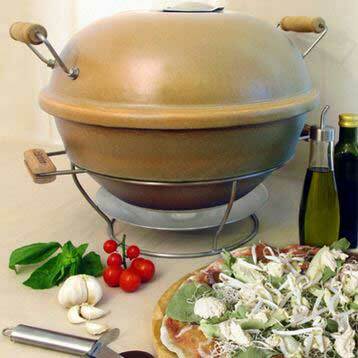 The Counter Top Pizza Oven makes authentic wood-fired pizza’s in your own home, quickly and easily. Even an Italian will agree! This oven was designed 1st and foremost to make the best pizza this side of Napoli, but that doesn’t mean it isn’t versatile. The bottom half of the oven used with the stainless grid is a handy portable braai, pop on the lid to turn it into a kette BBQ or a smoker. The Earthfire portable ceramic oven has all the cooking characteristics of a conventional pizza oven, at less than half the cost. Warm-up time is only 30 min as opposed to about two hours and it can maintain 350oC for hours with only one fire. This high temperature and the porous pizza plate is the secret behind our delicious authentic Italian style pizzas. If your favourite happens to be a thick based pizza with lots of juicy toppings, simply use less fuel to ensure a slightly lower cooking temperature. A pizza is ready at least every three minutes - literally before the previous one has been eaten. You can entertain groups of up to eight friends with ease. Whet their appetite with super quick pita starters – try something different like blue cheese or Camembert and green fig. Everybody will get the chance to prepare their favourite, there will always be a slice to sample. If you don’t like anchovies, wait only a few minutes for the next pizza. - Includes a steel pizza shovel, for transferring pizzas to and from the hot stone without touching it. The NilThermTM pizza stone is 100% Flameproof and safe to use directly on an open flame or element. 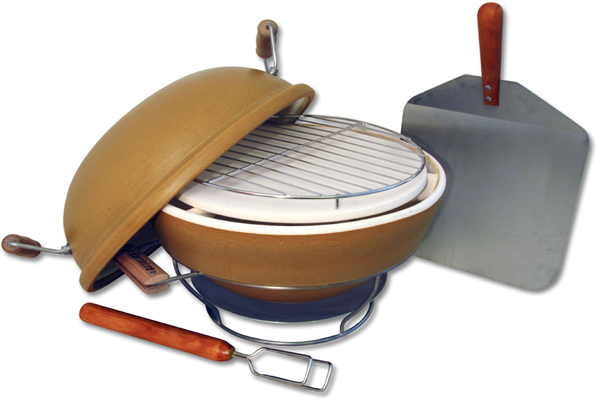 The ideal accessory for a kettle BBQ or gas grill, but is also suitable for use as a baking stone in a gas or electric home oven. The pizza stone in particular should never be used when wet. If it is unavoidable to use a wet oven or fire pit, start with a small, cool fire to completely dry the ceramic body. After 20 – 30 min of gentle drying it is safe to make a hot fire. 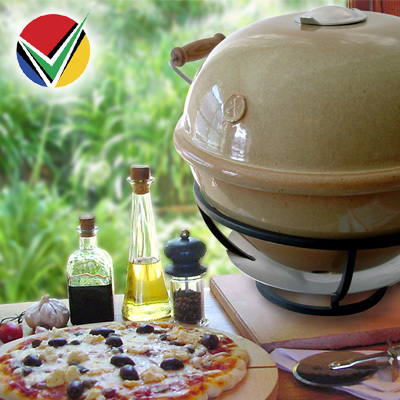 The Pizza Oven is guaranteed against thermal shock damage - dropping or hard knocks, however, are not covered. We can supply parts needed, should an accident occur. Should any product fail due to an unseen factory defect, Earthfire will honour the warranty.